Discussion in 'Effects, Pedals, Strings & Things' started by stratman89, Apr 24, 2016. I've started playing in a second band, and I'm looking at getting a smaller Pedaltrain because I require less pedals. I have a traditional Pedaltrain with the hard case and it's too bulky and too many pedals for what I need in the new band. My question is, which board would work for a Boss DD3, Boss Chorus, Xotic EP Booster and an OCD? Their website says 2 pedals for the nano and 3 for the metro. When I looked at the Nano today in the store, it looked all 4 pedals would fit, so I don't know. 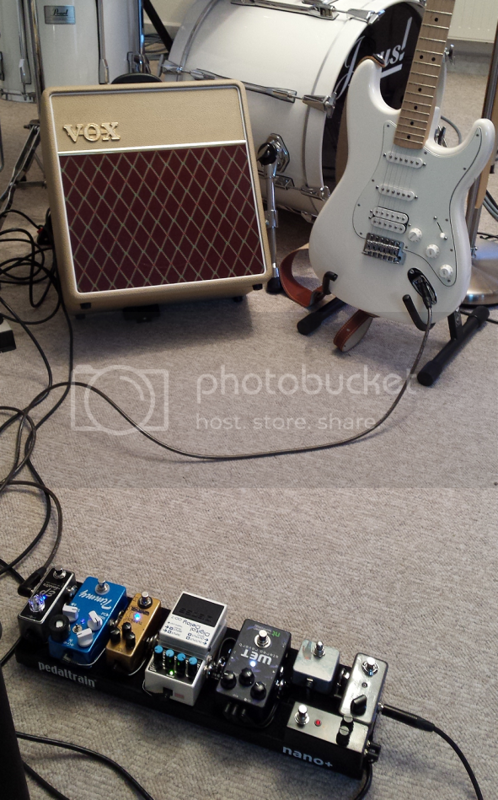 On my metro 20, I've got the MXR dc brick on top, powering a Boss TU-3 --> Timmy --> El Capistan --> Big Sky --> Ditto X2. So plenty of space for a couple of boss pedals, an EP boost and an OCD. earwax, Pao, rummy and 1 other person like this. It looks like I can get away with a Nano with a Volto power supply underneath. Thanks sooze. I forgot I need to add a tuner too. I think the Nano + might work. With a small enough tuner (Polytune mini?) and low profile patch cables, you might get away with a Nano. Nano+ will fit no problem, even with a full-size tuner. I posted my Nano+ board recently on the "Show your PB" - Threads. You really can squeeze a few pedals to the Nano & Nano+. You just have to play the tetris game - which is fun - and use small patch cables. I also ordered a TC PolyTune Clip Tuner because a tuner didn´t fit to my Nano+ board, maybe that´s also an idea. Here are a few pictures of my board, I hope that helps to get an idea. 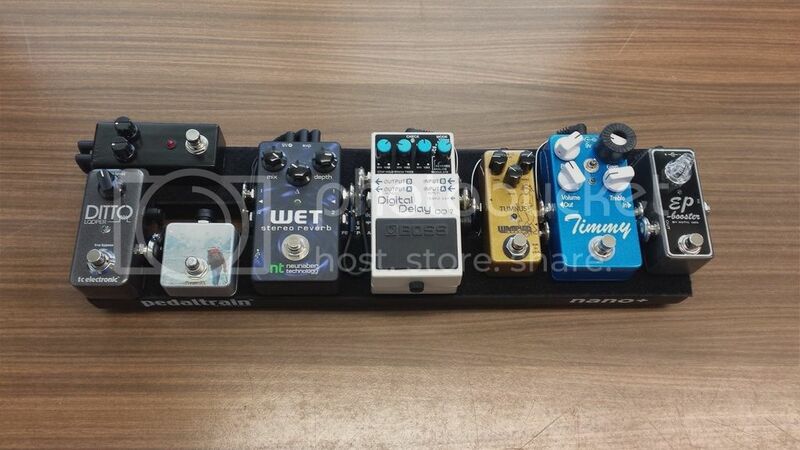 I recommend also scrolling through the "Show us your Pedaltrain NANO" - Thread, there you really get an idea which size is appropriate for your needs. Hope I could help. Hey OP, you should check out pedalboardplanner.com. It's great for answering your kind of question. you know, i've seen everyone's pedalboard planner pics, but never knew where they got them. Thanks for suggesting that!! I have four pedals on my nano+ and that's with two of them being rather large and having made no effort to use smaller patch cables in between. A nano+ would definitely be big enough for what you need. Well I went an bought a Nano+. A new version of the Volto is being manufactured as we speak. I haven't heard a release date yet, but expect it to be sometime in June. Keep an eye on our social media sites for information. Glad to hear the Volto will be back. It's great when used as intended (5 non-digital pedals for me). I get at least 10 hours and still have to turn on all the pedals and discharge before recharging. I'd hate to have to go back to a plug in supply. Nano or Nano+ will do fine. If you want a tuner the plus will be better, though I think a mini tuner could still work on the original (that or a head stock).